The Vernier Blood Pressure Sensor is used to measure systemic arterial blood pressure in humans (non-invasively). When used with the appropriate software, it can measure mean arterial blood pressure and calculate both the systolic and diastolic blood pressure using the oscillometric method. Connect the Blood Pressure Sensor to the interface. Attach the rubber hose from the cuff to the connector on the sensor. Wrap the cuff firmly around your partner’s arm, approximately 2 cm above the elbow. The two rubber hoses from the cuff should be positioned over the bicep muscle (brachial artery) and not under the arm. Important: The person having his or her blood pressure measured must remain still during data collection—no movement of the arm or hand during measurements. Quickly and repeatedly squeeze the bulb to inflate the cuff on your partner’s arm. Continue inflating the cuff to a pressure between 150 and 170 mm Hg. A meter in the data-collection software will display the live pressure readings from the sensor. When the maximum pressure is reached, set the bulb pump down onto the table. The built-in pressure release valve will slowly deflate the cuff. 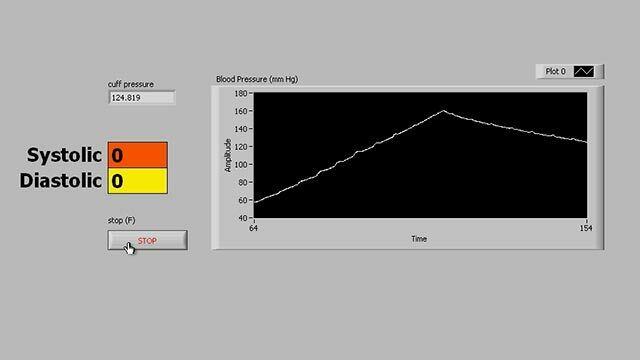 In this project, you will write a LabVIEW program to display the blood pressure of a test subject. The sensor produces an output voltage that varies with the pressure measured in the cuff. It includes special circuitry to minimize errors caused by changes in temperature. We also provide a filtering circuit that conditions the signal from the pressure transducer. The output voltage from the Blood Pressure Sensor is linear with respect to pressure. The software used with the sensor calculates the blood pressure parameters. The software used with the sensor determines the blood pressure of the subject by using the oscillometric method, a non-invasive means of measuring blood pressure. It is based on the principle that blood pumped through the arteries by the heart causes the arterial walls to flex. When a cuff (placed around the upper arm to occlude the brachial artery) is inflated and then slowly deflated at a constant rate, an arterial pressure pulse forms. These pressure pulses pass from the arteries, through the arm, and into the pressure cuff itself. When the artery is fully compressed, blood flow stops along with the pulsations. 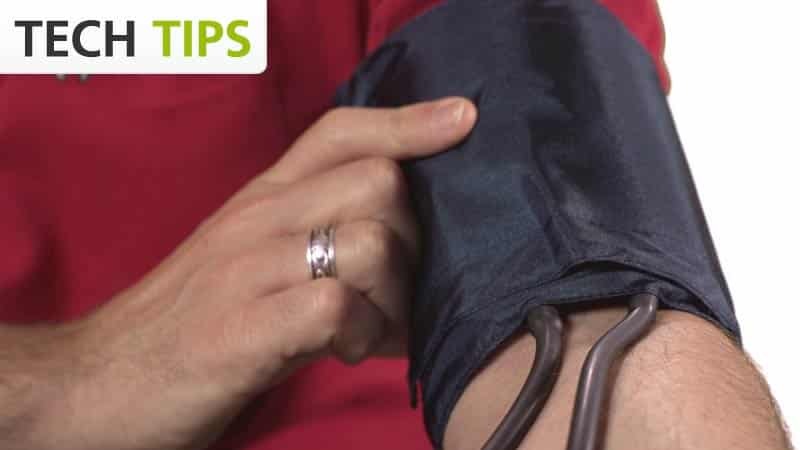 As the pressure in the cuff is slowly decreased, the arterial blood pressure increases to the point that blood is forced through the artery in short pulses. As the pressure in the cuff continues to decrease, more blood flows through the occluded artery and the pulses become increasingly significant until maximum amplitude is reached. Further decrease of the cuff pressure minimizes the occlusion of the artery and the pulses continue to decrease until the occlusion is removed. These pressure pulses, when separated from the decaying mean pressure of the cuff, form an oscillating waveform. The peak-to-peak amplitudes of this waveform create a bell shaped “envelope”. Within the envelope, the amplitudes of the waveform increase through the systolic blood pressure and continue increasing until the mean arterial pressure (MAP) is reached. Physiologically, the cuff pressure corresponding to the maximum amplitude approximates the mean arterial pressure. Generally, the systolic blood pressure is calculated by determining the point along the envelope prior to the MAP using a known percentage of the maximum amplitude. Diastolic blood pressure is calculated using the same method and the portion of the envelope following the MAP. Note that the Blood Pressure Sensor will not report blood pressure parameters until data collection has ended. Also note that you need to let the data-collection software finish collecting data to get accurate blood pressure readings. Do not stop data collection prematurely, allow the software to complete data collection. Blood pressure readings will differ from person to person and even between measurements on the same individual. Do not expect to receive the same measurements on each trial since there are many factors that cause a person’s blood pressure to increase or decrease. Use the following tips to take accurate measurements. The subject’s arm and hand must remain still during measurements. Proper placement of the pressure cuff will increase the accuracy of your blood pressure measurements. The rubber hoses from the cuff should exit over the brachial artery and 2 cm above the crease in the elbow. Accurate blood pressure readings depend on the use of a cuff of appropriate size for the arm. For younger students, a smaller cuff is available (18 cm to 27 cm). Our small blood pressure cuff can be ordered separately (order code CUFF-SM). A large cuff is also available for students with arm circumferences greater than 39 cm (order code CUFF-LG). Do not to touch or move the exhaust valve during measurements. Remove any clothing that may cover or constrict the portion of the arm being measured. For most individuals it is not necessary to inflate the pressure cuff higher than 170 mm Hg. Over inflation of the cuff may cause pain and/or injury. If the pressure release valve is exhausting slower or faster than 2.0 to 4.0 mm Hg/s, then adjust the exhaust rate of the pressure valve. The pressure release valve is set to release at a rate of 3.0 mm Hg/s on an arm that is 32 cm in circumference. For arms much larger or much smaller it may be necessary to adjust the valve so that the exhaust rate stays in the range of 2.0 to 4.0 mm Hg/s. With the bulb in hand and the hose leading away from you, place a screwdriver into the metal slot on the top of the release valve. To increase the rate of exhaust, turn the screwdriver clockwise. To decrease the rate of exhaust, turn the screwdriver counter-clockwise. The larger a subject’s arm the slower the release valve will exhaust. To record proper measurements at altitudes above 6,000 ft (0.8 atm or 609 mm Hg) the pressure release valve will need to be readjusted. The pressure release valve is set to release at a rate of 3.0 mm Hg/s at sea level, where atmospheric pressure is 1 atm or 760 mm Hg. At higher altitudes, the pressure release valve will exhaust at a slower rate. To use the Blood Pressure Sensor at altitudes above 6,000 ft, open the pressure exhaust valve by turning it a half turn clockwise. See the instructions above. Verify that the exhaust rate is now in the range of 2.0–4.0 mm Hg/s after making the adjustment. If you have watched the related product video(s), followed the troubleshooting steps, and are still having trouble with your Blood Pressure Sensor, contact Vernier Technical Support at support@vernier.com or call 888-837-6437. Support specialists will work with you to determine if the unit needs to be sent in for repair. At that time, a Return Merchandise Authorization (RMA) number will be issued and instructions will be communicated on how to return the unit for repair.